When death breaks into our lives, the great questions of human existence and destiny confront us. What is life? What is death? Is there an afterlife? Often it is only in the midst of tragedy that these issues are given much attention - but the basic orientation of Christianity is towards heavenly hope. Bruce Milne takes us on a journey through the biblical teaching about the awesome realities of heaven and hell - destinies central to our understanding of God and humanity. He begins with an examination of some key Old Testament texts, then moves on to the teaching of Jesus, and finally surveys other relevant New Testament passages. Debate continues about this area of Christian belief, but the life to come is a biblical 'fact of life', and the eternal God assures us, repeatedly and clearly, that he will meet us all in eternity. 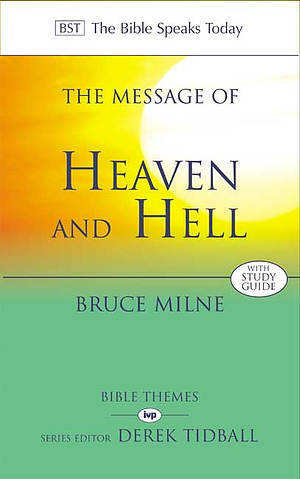 The Message of Heaven and Hell by Bruce Milne (Former Lecturere in Biblical and Historical Theology, Spurgeon's College, London) was published by Intervarsity Press in June 2006 and is our 15612th best seller. The ISBN for The Message of Heaven and Hell is 9780851112763. Be the first to review The Message of Heaven and Hell! Got a question? No problem! Just click here to ask us about The Message of Heaven and Hell.